The Maimonides Heritage Center, Mercaz Moreshet HaRambam is dedicated to disseminating the teachings and world outlook of Rabbi Moshe Ben Maimon, also known as HaRambam and Maimonides to the larger public while creating a spiritual and cultural renaissance among world Jewry. Whereas a central feature of Maimonides’ world view is Chesed, acts of love and kindness the Maimonides Heritage Center has embarked on an extensive social welfare program assisting those in need and in crisis in the city of Tiberias which is host to the Center’s campus. Our goals and our vision are in perpetual evolution. We as an organization are committed to excellence and serving the Jewish community with the highest degree of integrity. 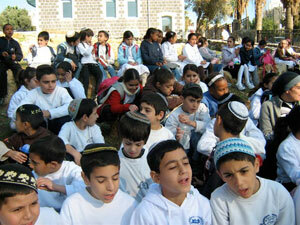 Our goals include transforming the city of Tiberias into a cultural and educational center as it once was. Tiberias was an ancient capital of the Jewish state and the center of Talmudic law. The Jerusalem Talmud was canonized in Tiberias and the last Sanhedrin, Supreme Court of Israel was convened in Tiberias. The spirit that propels the effort of the Maimonides Heritage Center is based on the belief that Rambam’s legacy is not only relevant but a compelling religious and philosophic voice in modern man’s / woman’s search for a spiritual community and personal equanimity. Rambam’s theological and political legacy addresses many of our modern days community’s most pressing issues. It is our strong conviction that the reemergence of Rambam’s world view can have a potentially profound influence both in the Diaspora and in Israel. Rabbi Moses ben Maimon, known in Hebrew literature as the RaMBaM and in western culture since the Renaissance as Maimonides, is perhaps the most famous and resplendent figure of medieval Judaism. His fame is a direct result of the quality and quantity, scope and originality, magnetism and fascination of his writings. For Maimonides- born in Cordova, Spain (1135/8); died in Cairo (Fustat), Egypt (1204) - was a prolific author of amazing vigor and precision, of intellectual, moral and religious force of analytic sharpness and aesthetic delicacy. This is well known and generally appreciated often with a dash of gratuitous hyperbole. In truth his reputation needs no inflation or exaggeration for his stature is nearly sui generis and his commanding influence has been almost universally recognized. His literary oeuvre was not only remarkably comprehensive but also endlessly repercussive. He wrote epoch-making works in the central areas of Halakha and religious philosophy- an achievement that is unquestionably, almost overpoweringly, characterized by monumentality, using the term very literally. His works representing an unprecedented conjunction of halakhic authority and philosophic prestige, were extensively studied, meticulously annotated, frequently translated and intensively interpreted. Their influence direct as well as indirect reflected through many works in various genres by a host of authors, was global. His mighty historical imagine assumes heroic proportions rather early in his posthumous career, and it is this heroic figure which dominates the stage. We envision the Museum at the Setton Family Hospitality Center will be a draw for visitors to learn more about Maimonides. We hope to purchase more land around the Grave and build a community center and larger educational complex. Part of the vision includes a Guest House and a School of higher education that espouses and disseminates the teachings of Maimonides. Stay in touch and be a part of this great project.